The threats posed by climate change and overexploitation of the oceans are already being felt. All will be affected, none more so than the poorest costal and island populations. With the crisis in our oceans and its devastating ecological consequences now abundantly clear, global solutions are needed. Overfishing, rising sea levels, huge dead zones, and waste plastic in the ocean: these are hard facts, generated from sound data brought together by renowned marine scientists from across the world and available internationally. Experts, relying on ever-improving digital measurement methods and imaging techniques, are extremely concerned and warn of a scenario that affects everyone. It is beyond dispute: our oceans are in crisis. The seas are suffering due to climate change. Scientists consider acidification, sea warming, and rising sea levels to be the three biggest problems we are facing. The main cause of climate change is CO2 released by humanity into the atmosphere by the burning of fossil fuels. As the ocean absorbs too much CO2 it gradually becomes acidic, while increasing temperatures push sea levels up and cause huge changes to marine ecosystems. Fish, coral, mussels, and crustaceans bear the consequences of this damage. Sometimes, the ecological consequences acidification are irreversible, such as when species known as ‘foundation species’, such as seagrass bed or coral, become threatened in an ecosystem. If the foundation species dies out then an ecosystem’s entire habitat is in danger. This applies to northern European mudflats and Pacific coral reefs alike. Consider the Great Barrier Reef in Australia: up to 93 per cent of it has been affected by coral bleaching, which could spell the end of 360 hard coral species as well as 80 soft ones which are home to over 1500 species of fish, 1500 species of sponge, 5000 species of mollusc, and 200 species of birds. Many marine mammals such as the manatee would also be affected. When it comes to ocean acidification, reality has already outstripped initial forecasts. In March 2017, a pH of 7.6 was measured in the Humboldt current along the coasts of Peru and Chile – a value that was originally forecast for the year 2100. For now, at least, the ocean slows the pace of climate change. The lion’s share of the heat (93.4 per cent) created by human CO2 output over and above the natural greenhouse effect is absorbed by the ocean. This is only possible because of strong ocean currents. You do not have to be able to interpret the digital data of global flow patterns to recognise the risks: too much is too much. Believing the sea to be infinite is a romantic illusion. While oceans are doubtless slowing down the effects of climate change, the initial consequences of the crisis in our oceans are already visible and habitats, including human habitats, are changing. The ocean covers 71 per cent of the globe. 80 per cent of the world’s population lives within 150 kilometres of the coast. 13 of the world’s 15 mega-cities, with hundreds of millions of inhabitants, are located directly by the sea. What will happen to the people in these high-risk areas if sea levels continue to rise dramatically? Flooding, erosion, decline: the latest edition of the World Ocean Review reports that our coasts are under increasing pressure, with people living in coastal regions being most at risk. These populations are increasing in number: by 2050, around 22 per cent of the world’s population – which will by then be around 10 billion – will live directly on coasts. Global sea levels have risen by 20 cm in the last hundred years. By the end of this century, they could rise by a metre. Meanwhile, poor countries are disproportionally affected by the crisis. States in the South Pacific, such as Kiribati and Fiji, are not only trying to protect their flat atolls from storms by building walls – primitive when compared with the Dutch structures – but they are also actively preparing their people to leave their country and become climate refugees elsewhere. Anote Tong, former president of Kiribati, has launched a migration strategy with the motto ‘Migration with Dignity’ which seeks to allow the 100 000 or so residents of Kiribati to be accepted into other countries. It is doubtful, however, whether this can serve as a template for the 20 to 25 million people living in the areas of Bangladesh which are at risk of flooding. The country is currently one of the most densely populated in the world, with some 170 million inhabitants. The same is true of mega-cities such as Bangkok and Jakarta, with over 8 million residents, or Mumbai, where more than 18 million people live. These people cannot simply flee to the already densely populated inland areas or even to neighbouring countries. As though the consequences of climate change were not bad enough, our severe over-exploitation of the sea is an additional strain. An example of this is overfishing: 90 per cent of global fish stocks are being fished at their upper limit or are already being overfished. The loss of biological diversity is especially worrying. Fish is a cornerstone of global food security. Of the products taken straight from nature, fish is the most-traded product in the world. Fishing is heavily subsidised in every country in Europe and political forces are maintaining the pressure on stocks. Illegal, unregulated, and undocumented fishing is yet another obstacle to maintaining fish stock levels, with 31 per cent of global catches illegal. Despite more stringent port controls on the part of the European Union, illegally caught fish continues to end up on European plates. Subsidising oversized fishing fleets – as happens in Spain and Portugal – exacerbates fish stock depletion. If 90 per cent of large fish such as marlin, tuna, shark, and cod are already overfished today, what does this mean in the context of an exponentially growing global population? The simple truth is that if fisheries ministries were to systematically follow scientific recommendations and stocks were only fished in a way that ensures maximum sustainability over the long term, we would witness an increase in the number of fish in our oceans. The problem is not just related to what we are taking out of the oceans; what we are putting in to them is also an important factor – plastic waste, above all. Only 20 per cent of plastic waste that ends up in the ocean is created at sea. 80 per cent is created on land, specifically in countries which have either no or very weak waste management systems. We produce 8 million tonnes of plastic per year. Only 1 per cent of that is found on the surface of the sea. The other 99 per cent is invisible, accumulating as microplastic at the bottom of the sea where it is absorbed by organisms, eventually coming back to us through the food chain. As of yet, no research has been concluded into the consequences of consuming microplastic as studies only began in 2007. Increasing global tourism is an additional source of pressure for the oceans and for coastal populations. These days, a full third of global tourists travel to the Mediterranean, a relatively small area. 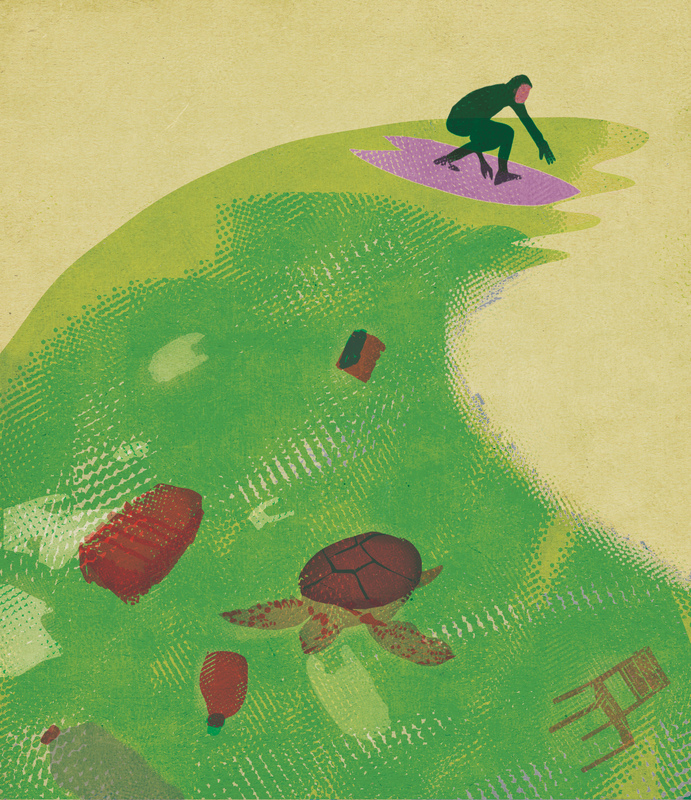 The waste mountains along some coasts are a problem we can all see. Yet often, the link between ourselves and the sea is invisible. What we eat, what we use to brush our teeth, where we travel to, which clothes we wear – all of these things have an effect on the ocean. 90 per cent of global trade is done by sea. Ships and shipping lanes are the arteries of the world. Moreover, many countries are now looking to the sea – and the large areas of uncharted deep sea in particular – as a place to draw resources to satisfy the global demand for energy and raw materials, especially in-demand metals [read more on this here]. The sea absorbs lots of things – more than it can handle – including greenhouse gases, oil spills, chemicals and heavy metals, radioactive waste, and military pollution. On top of this, tonnes of manure and fertilisers have flowed into the ocean since the 1950s and 60s due to an increase in industrial agriculture with intensive animal rearing and farming. Any excess ends up in the sea through ground water, and leads to there not being enough oxygen in estuaries. While these areas are subject to national sovereignty, action is taken in Europe in the form of international agreements. National regulations are not sufficient if neighbouring countries continue to pollute. Take, for example, the Baltic Sea. In terms of surface area it is one of the largest minimum oxygen zones (or ‘dead zones’) in the world. Until the 1980s, nitrogen inputs in the Baltic quadrupled while phosphate inputs increased eightfold compared to the beginning of the last century. In 2007, the countries bordering the Baltic adopted the Baltic Sea Action Plan, agreeing concrete targets for reducing these inputs. This is more than just lip service: the stated aim of the European Union is to put an end to the eutrophication of the Baltic. Failure to comply with the action plan will see signatories appear before the European Court of Justice, which is what happened to Germany in 2016 when it had breached its limit for groundwater nitrates on around a third of its land area. The Greens are accusing the German federal government of failing to act, and are demanding protections for the sea in their own action plan. Things are different on the seas beyond the limits of national jurisdictions. These are some of the least protected areas of the world and are some of the least responsibly managed. National legislation applies within exclusive economic zones when it comes to resource exploitation and environmental protection, but outside of these areas international law applies, and it is not very comprehensive. Pirates can be tried under international law by anyone who wants to do so. However, polluters, illegal fishing fleets, terrorists, arms dealers, drug smugglers, and human traffickers cannot. The responsibilities international organisations have are often opaque at best. The high sea is, territorially speaking, a no man’s land. But when it comes to how it is used, it is more like every man’s land. That needs to change, and quickly. The world’s oceans must be made the focus of more effective and binding international agreements. On top of this, new courses of action must be set by the United Nations and the European Union. Agenda 2030, which was agreed by the United Nations in 2015 and focuses on sustainable development, offers a huge opportunity to launch a more holistic approach to marine protection. One of the goals of Agenda 2030 – Sustainable Development Goal (SDG) 14 – is to protect oceans, seas, and marine resources and to develop them sustainably. The objective has seven sub-goals, which seek to prevent marine pollution, protect marine ecosystems, put an end to overfishing, establish protected areas of the sea, and to counteract the consequences of ocean acidification. Setting and working towards ambitious shared goals for the sea can help strengthen marine protection and also move us closer towards closing the serious loopholes that continue to exist. This model of sustainable fishing is known as the Maximum Sustainable Yield (MSY). ‘Eutrophication’ is the name of the effect of sea over-fertilisation which cuts off oxygen to sea creatures. The German Greens call for rest areas to stop overfishing; waste-free oceans through a reduction in waste plastic; and the conversion of ships to use clean fuels, amongst other things.